If you enter the online forum world you will find there is a never ending debate as to how a business shirt should fit you. Putting personal taste aside, the fact is, the way a business shirt should fit is a moving target depending on fashion trends, age group and most importantly, what corner of the globe you are in. Corporate shirting trends tend to be less volatile compared to casual shirts due to the conservative nature of the market. However, the way a business shirt should fit will differ tremendously whether you ask Todd from Texas USA, or Fabio from Rome, Italy. 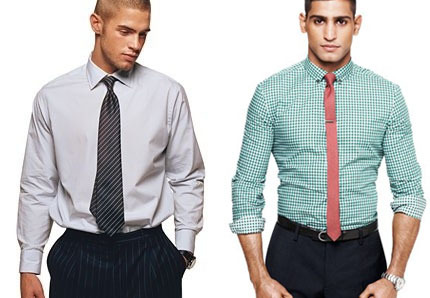 When we are debating the fit of a shirt, it basically comes down to how tight it should be. At one end of the spectrum we have conservative parts of the US where the shirt should swim on you, and there should be plenty of room to move, and right at the other end of the spectrum we have Italy and Singapore where the shirt should hug every contour of the body and showing a single fold or sag is sacrilege. Sitting in the middle we have countries influenced by both US and European cultures such as Australia and UK where the perfect fitting shirt should be fitted but not too tight. So next time you order a shirt online, take a look at the specs, take into consideration where in the world you are located and what your respective expectations are, as one man’s slim fit may be another man’s loose fit!.